VINES: Grape varieties used are red Malvasia, Canaiolo, Ciliegiolo, Montepulciano. APPEARANCE: Ruby red with purple reflections, good consistency. AROMA: Intense and persistent with fruity, winey and floral nuances. TASTE: Concentrated and fruity, soft, very pleasant. PAIRINGS: ChicchiRossi I.G.T. 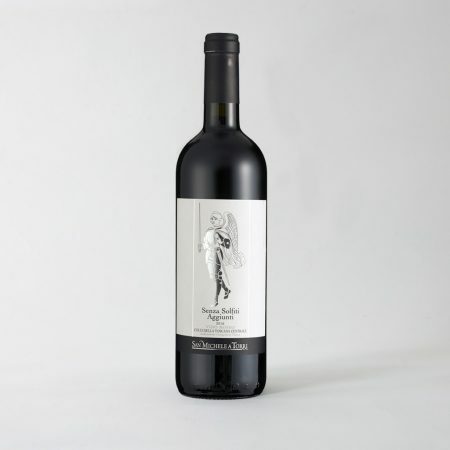 Red Colli della Toscana Centrale is a wine that is well suitable for all dishes. It matches very well with many appetizers thanks to an interesting olfactory appearance with well-marked fruity and floral scents. For example Tuscan crostini with pate or salami and cheese would be a perfect combination. It pairs best with tasty meat sauces such as amatriciana or carbonara for the first course and with roasted meats, such as roast beef, for second courses, where the tannic and alcoholic components match well. 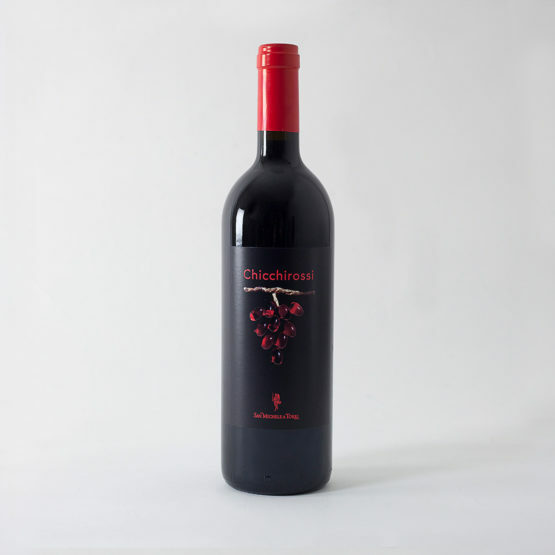 Chicchirossi is a wine produced within the Hills of Central Tuscany with Red Malvasia, Ciliegiolo, Canaiolo, and Montepulciano grapes. The grapes are picked by hand, placed in boxes and transported in the corporate center where they are passed on top of a sorting table in order to select only the best berries. This system of collection and selection of grapes, although more expensive than traditional, allows us to increase greatly the quality of our wine. During the sorting, all of the grapes not perfectly ripe are removed. We are careful not to leave pieces of stalk and leaves that if vinified can lower the quality of the wine. 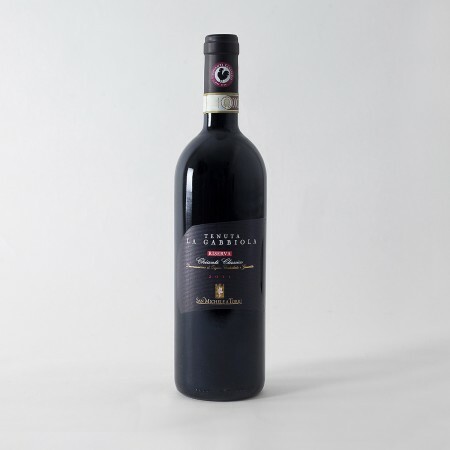 We chose not to use for this wine Sangiovese, instead we wanted to enhance the complementary grape varieties of Chianti such as the Red Malvasia and Ciliegiolo which give a very fruity flavor, and the Canaiolo and Montepulciano which give nice body and roundness. The result is a very charming wine that is aged for one year in barriques and tonneaux before being bottled. Soil: The soil is semi soft with tendencies of clay. Because it is a skeletal-rich soil, it is considered on average, fertile. Training: The training method used is sapling, with a planting density of 7,000 vines / hectare. Harvest:The harvest is done manually at the end of September. All the grapes are passed to the sorting table for the selection. Fermentation and soaking: The fermentation takes place in 28 ° / 30 ° C steel containers. The maceration lasts on average 15 days. Aging: It is aged for one year in barriques and tonneaux. Appearance:Ruby red with purple reflections, good consistency. Considerations: It is a balanced wine that is best consumed within 4/6 years after harvest. 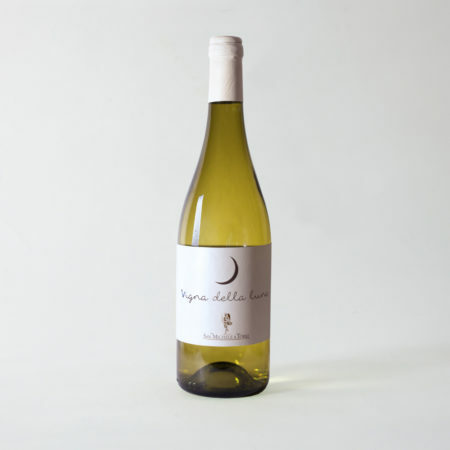 This wine takes its name from a vineyard called exactly like this bottle “Vigna della Luna”. VINES: Chardonnay 70%, Pinot Bianco 25% and Petit Manseng 5%. APPARENCE: straw yellow with hints of green. AROMA: fruity with golden delicious apples and white flowers. TASTE: warm, smooth, tasty and fruity. SERVING SUGGESTIONS: White wines are traditionally served with fish, but we recommend this wine with dishes such as “trippa alla fiorentina” (tripe) or “lampredotto” an offal dish typical to Florence, white meats, and blue-cheese and aged cheese. It is also very good served with vegetable first courses and dishes rich with aromatic herbs. VINES: Trebbiano (80%) and San Colombano (20%) APPEARANCE: Amber yellow with nuances of copper. Very dense and consistent. AROMA: Notes of sweet dried fruit, dried figs, dates, dried apricots and honey with ethereal notes of enamel. TASTE: Warm and very pleasant with a fruity and sweet entrance and dry finish. PAIRINGS: We believe this wine is best in the middle of the afternoon while reading a good book or listening to music. Besides this type of pairing we also think it tastes great with blue cheese, goat cheese and pate. VINES: Sangiovese (40%), Cabernet Sauvignon (40%), Colorino (20%) APPEARANCE: Ruby red, dense and consistent with violet hue reflections AROMA: Intense and persistent with hints of pepper, tobacco and coffee but also fruity with notes of herbs and flowers. TASTE: Warm, soft and fruity with elegant tannins, finishing off with a hint of toasted flavor. SERVING SUGGESTIONS: A great wine best when combined with many second courses such as wild boar, bittersweet hare, roasts and of course the Florentine steak. The tannins contrasts the succulence of the meat while the alcohol cleans the pallet and washes down the fatty flavor. 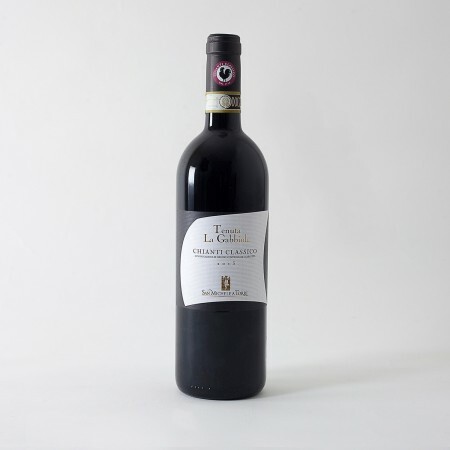 The grapes that make up this wine are Sangiovese (up to 80%), Canaiolo, Colorino and Merlot. 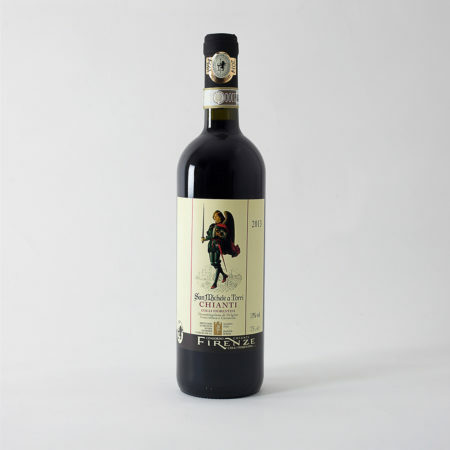 Simple and straightforward, the Chianti Colli Fiorentini wine is very balanced and is suitable for food of all, everyday occasions. The color is bright red, transparent with good texture. The flavor is flowery and fruity while intense and persistent. On the palate a fresh and tannic softness is revealed. 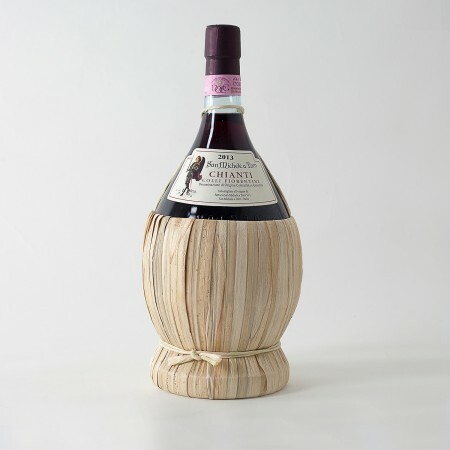 The flask is the historic bottle of Chianti wine; a blown glass container 1,5lt. coated with straw just up until the elongated neck. Taste: Warm, soft and fruity with soft tannins and pleasant acidity. Pairings: It is a wine that is well suited for both first and second courses. It pairs well with rich lasagna and grilled meat and roasts. The tannins react with the succulence of the meat, while the alcohol and acidity cleanse your palate from the fatty flavor. Appearance: Garnet red with brick nuances. Aroma: Sweet floral notes of rose. Taste: Warm and sweet yet fresh and lively. Pairings: A great wine after meal and goes well with all types of biscuits and dry cakes. It is excellent with fruit tart and can be combined with medium aged cheeses. The grapes used are Sangiovese (up to 80%), Canaiolo, Colorino and Merlot. 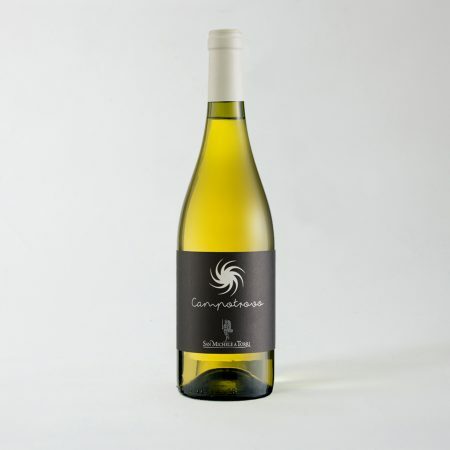 The wine is simple and straightforward and is very balanced for everyday occasions. The color is bright red and is transparent with good texture. The taste is intense and persistent with a very flowery and fruity flavor. The soft tannins leave a freshness on your palate. 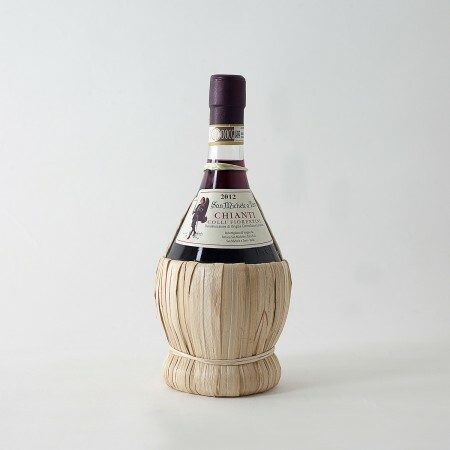 The flask is the historic bottle of Chianti wine: a brown glass container coated with straw just up until its elongated neck. Grappa is obtained by distilling the Colli Fiorentini Chianti pomace produced in the Fattoria San Michele a Torri. The master distiller and other workers on the property have the capacity to make this a great value product that is appreciated by the public. Grappa enthusiasts are constantly in search of finding a grappa of higher quality. 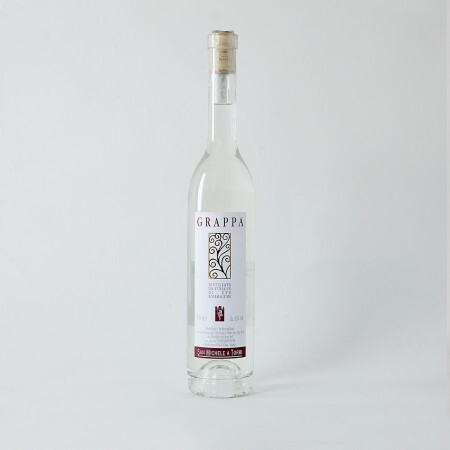 Our grappa is very fragrant and strong yet soft at the same time. It is excellent to be enjoyed after a meal with your friends or alone during times of relaxation and meditation. Appearance: Ruby red with good consistency and purple reflections. 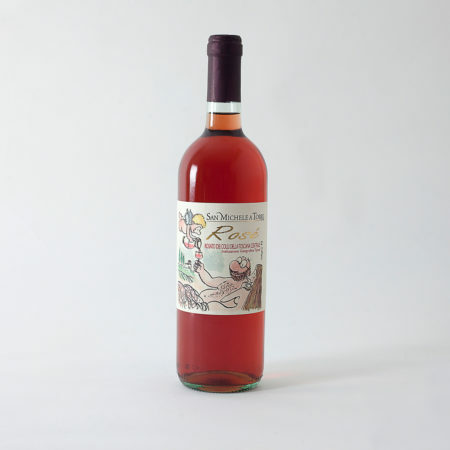 Taste: This wine is soft with a lively freshness of pleasant tannins. Pairings: Suitable for all dishes. It matches very well with many appetizers thanks to an interesting olfactory appearance with well- marked fruity and floral scents. For example Tuscan crostini with pate or salami and cheese would be a perfect combination. It pairs best with tasty meat sauces such as amatriciana or carbonara for the first course and with roasted meats such as roast beef for second courses. Aroma: Strong aroma with fruity and floral nuances. Taste: Warm and fruity with pleasant acidity. Pairings: This wine is nicely paired with appetizers such as cold cuts and cheeses however, it can most definitely be poured throughout the entire meal because of its freshness. VINES: Sangiovese (100%) APPEARANCE: Ruby red, dense and consistent AROMA: Intense and persistent with floral and fruity aromas with a note of spices TASTE: Warm, soft, fruity with tannic pleasant acidity. 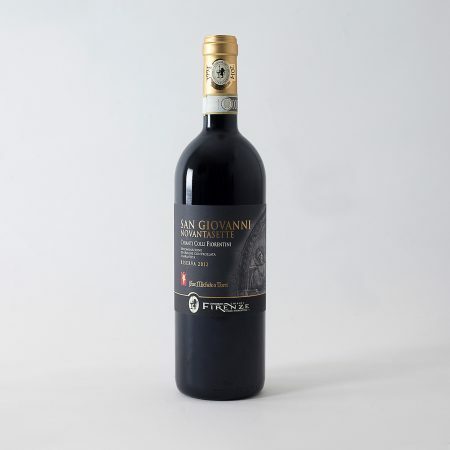 PAIRINGS: Chianti Colli Fiorentini DOCG Riserva “San Giovanni Novantasette” is suitable for all meat dishes. It is excellent with the typical Florentine steak however, in our mind, it is best with traditional Tuscan stews such as the famous peppered meet, “Peposo”. In fact, the wine aroma blends well with the taste of the gravy, while the alcohol and tannins contrast with the fat and flavor of the meat.